Figure 1. The vernal equinox marks the first day of spring and occurs at the intersection of the ecliptic and the celestial equator. The vernal equinox also marks the zero point of the Zodiac. 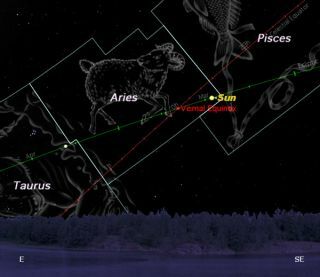 The science behind astrology may have its roots in astronomy but don’t confuse these two disciplines. Astronomy can explain the position of the stars in the sky but it’s up to you to determine what, if anything, their alignment signifies.